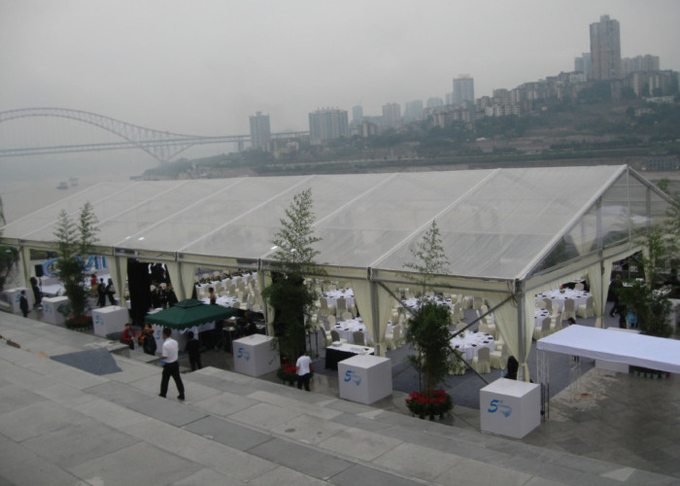 A clear tent will make your wedding elegant and luxury. People can see the beautiful sight from the inside of the tent. 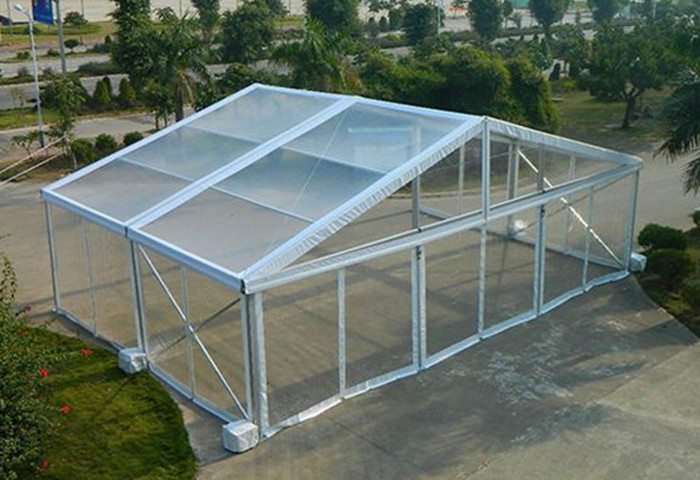 This clear pvc aluminum structure tent is with long life span aluminum structure, clear pvc roof and side walls which can be easily opened or closed as your wish. It can be used for 100-1000 people use. The size can be customized according to the people to accommodate. The main frame is hard pressed extruded aluminum profile which can be used over 15 years, this structure can be easily extended or shortened to meet different requirements. The roof cover and side wall cover are clear high quality double PVC-coated polyester textile, 100% waterproof, flame retardant to DIN4102 B1, M2, CFM, UV resistant, tear resistant, self-cleaning ability, etc. The roof cover can be easily replaced by white pvc or clear pvc after several years. The side cover can be replaced by white pvc, glass walls, sandwich wall or ABS walls. For ground that cannot be destroyed, such as tile floor or wooden floor, we can provide weight plate for fixing. 2. Better view from inside of the tent compare to the white tent. 3. The tent is put up by screws, easy to be assembled and dismantled, and easy to transport and store. 4. Elegant and luxury appearance. 5. The length can be shortened or extended according to your events.